It seems like all we’ve been writing about this month is booze—National Wine Day here, Cinco de Mayo margaritas there. We’re not complaining. In fact, we’re closing out our month of incidental inebriation with a preview of next month’s alcohol-soaked celebration: Negroni Week. It runs from June 4 to June 10—and it’s not just in deference to the classic Italian cocktail, which is made up of gin, vermouth and Campari. The five-year-old event raises money for charities around the world and each participating bar or restaurant picks their fave. If you’re feeling like a negroni next week, be sure to take your big-hearted, thirsty self to these Miami bars. 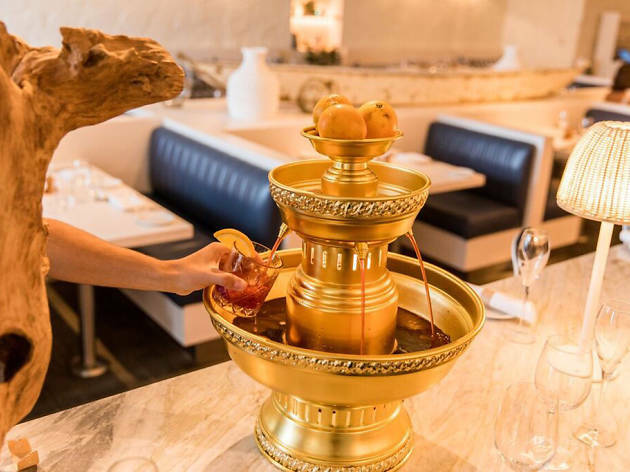 For people who really love negronis, enough to guzzle them in unlimited amounts, La Centrale’s negroni fountain is a dream realized. Pay $15 and drink to your heart’s content from 4 to 7pm every day next week. Proceeds benefit: Slow Food International, a global organization that works toward providing good, clean and fair food for people around the world. Throughout June, the Belle Isle hotel offers a namesake negroni called the Belle Isle Sunset. It is available during happy hour and as a verbal special on the weekend for $8. Proceeds benefit: No Kid Hungry, a national initiative that raises money to provide free meals for children. Beaker & Gray’s nitro negroni is a creamy concoction that mixes Botanist gin, Cocchi Torino and Campari. It looks like cold brew but makes you feel much better than coffee ever could. Proceeds benefit: CORE, an organization that benefits food and beverage service families in need. The Angler’s new bar, which officially opens its doors this summer, hosts a special Negroni Week cocktail competition: Bitter Battle. Tickets are $20 and include samples of all competing drinks and small bites. You have your choice of two styles at the Italian restaurant: classic, made with Fords gin, Campari and Carpano Antica vermouth; or modern, which swaps the Campari for Gran Classico bitters. Proceeds benefit: James Beard Foundation, the New York City-based culinary arts nonprofit. Called the Negramaro, this negroni subs in grappa, Italian brandy, for the traditional gin and adds in Calabrian liqueur Vecchio Amaro del Capo to the usual Campari and vermouth mix.